The treadmill offers a way to walk, run or jog indoors when the weather, schedule or terrain does not promote outdoor exercise. Whether you are a beginner trying to achieve a level of fitness for health or a seasoned runner, you can benefit from incline and speed work on the treadmill. Regardless of your specific goals, incorporating these modalities will improve your endurance, leg strength, calorie burn and lung capacity. Expect commerical treadmills, like those found in a fitness center, to range in speed from .5 mph up to about 12 or 15 mph. The inclines on these treadmills also range from zero percent to 15 percent, with some treadmills offering inclines of as much as 30 percent. Home versions of treadmills often have lower settings, so check with your manufacturer before purchasing. Speed work, often referred to as Fartlek training (Swedish for "speed play"), refers to spurts of speed inserted in the middle of runs. The length of these drills may vary, from very specifically timed intervals of 15 seconds to three minutes with timed recoveries, to unplanned drills that challenge you off and on during your session. You do not have to run to include speed work—you might be a walker striving to run and alternate jogging and walking. Hills may be included during a running workout or be used by a treadmill walker to make a workout more challenging. Runners may include treadmill hills as part of a long training run, focus on one long hill or run short hill drills at an increased pace. Using a treadmill helps runners who do not live in a hilly area and allows them to arrange their workouts so as to help meet their goals. Walkers may simulate a hike and build glute and hamstring muscles by adding an incline to their workout. 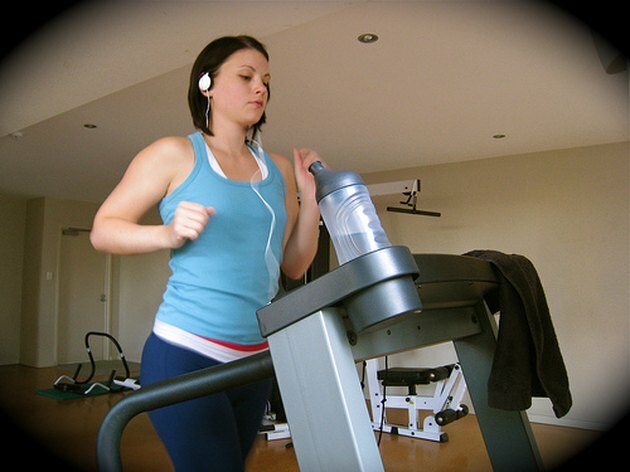 Adding an incline or speed increases the amount of calories you burn in your treadmill workout. A 150-lb. woman can burn 800 calories in an hour running up a five-percent incline at 6 mph, as opposed to 550 calories in an hour running at the same speed on a flat treadmill. Hill running (or walking) also improves leg strength, efficiency of movement, form and aerobic conditioning. Speed drills contribute to improved endurance and fat-burning capacity. In a 2005 study published in the Journal of Applied Physiology, researchers showed that just two weeks of interval training doubled endurance levels in six of eight college-age athletes. Another study in a 2007 edition of the Journal of Applied Physiology showed that performing intervals of hard exercise (like speed drills) helps the body become better able to burn fat. In this Canadian study, eight women performing interval workouts over the course of two weeks increased the amount of fat they burned in an hour of moderate exercise by 36 percent. As an added bonus, these intervals helped increase the women's oxygen efficiency by 13 percent. Choosing hill work or speed work really depends on your goals. A walker who is unable to run because of joint problems may find hill work a preferable way to increase the intensity of the workout as he can avoid the impact of running. Runners looking to improve their training for an outdoor race benefit from treadmill hill drills because it prepares them for outdoor terrains. Speed drills are appropriate for experienced runners looking to increase their overall running speed. Aspiring runners benefit from speed drills as it gives them an opportunity to ease the body into running without overdoing it and risking shin splints and extreme muscle soreness. Ideally, including both types of work in your running or walking workout will benefit your overall fitness level and help you achieve your goals. Regardless of the workout you choose, be sure to warm up and cool down appropriately, wear proper footwear and stretch. High-speed intervals should not be performed every day. Even if you do not feel completely exhausted afterwards, speed work stresses the musculature of the body. Treat high-intensity speed intervals as you would strength training, and leave about 24 to 48 hours between sessions. Intense interval training that drives your heart rate up to 80 or 90 percent of maximum is inappropriate for people with cardiac conditions. Cross-training on and off of the treadmill will help you prevent injury in the long run.